Aw, I'm sorry for your loss. What a trooper! 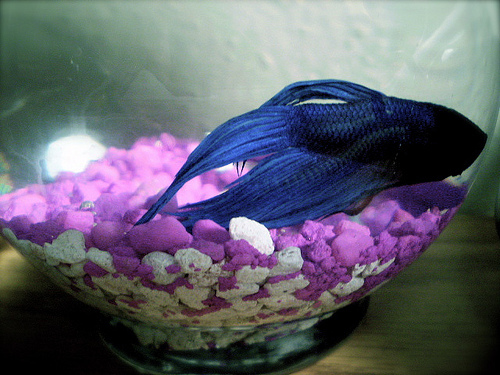 Siamese fighting fish are incredibly melodramatic when they're dying. Mine took six weeks to finally shuffle off the fishy coil, and he spent most of it lying on the bottom of his tank feebly waving a fin. Happy swimming, Bluefish, you deserve a 21 flush salute for taking 3 years to die. OMG you made me laugh out loud!! Best comment ever! That was it, B. He was our little fighter. The kids were sad, and I lost my cooking buddy. Will you get another? Life is just too boring without the ability to make something uncomfortable with whitefish. RIP Bluefish. Sounds like he led an exciting life. RIP little BlueFish. He sounds like he led the life of a Warrior. Poor little BlueFish. He deserves the Purple Heart of Fishery. Reminds me of a production of Antony and Cleopatra that my professor once described, where Antony died at great and melodramatically theatrical length. RIP, Thespian Bluefish. I was JUST watching From Russia With Love and the whole first scene where the headless guy is stroking the white cat is intercut with scenes of Siamese Fighting Fish going at it. If he survived that type of fight, he really was a scrapper. Or maybe he didn't want to give you and your white fish the satisfaction. OOOH. That reminds me, my boys would love that scene. No. Wait. Too Soon. you're so funny. Is he really dead? Great post, Alexandra. I so enjoy you. Rest in peace little fish. Oh...I am so sorry. He sounded like one amazing fish! I have known friends with fish and have never heard of any fish surviving that long. And I loved the metaphor for life that you wrote on FB! It's even sad when a stupid little fish dies. Why cruel world? Why? We used to have one growing up too. A fishy era has past for both of us ;-) Let's just not get puppies, okay? Pinky swear.